A couple months ago, the girls in my youth group started going through the Lies Young Women Believe: And the Truth That Sets Them Free study by Nancy Leigh DeMoss and Dannah Gresh. In all honesty, before we started, I didn't think I needed it. As it turns out, I didn't realize how badly I did need it. 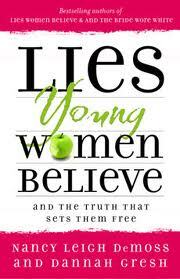 Lies Young Women Believe examines the 25 most common lies Christian young women believe about God, Satan, themselves, relationships, guys, media, sin and their futures and reveals God's Truth about them. There's a Companion Guide that goes along with the book, which I would definitely recommend using. It splits the book into a nine week study and there are study questions and exercises that correspond with what you're reading that week. They also make good use of colour and graphics so it's visually appealing. Sure, you may wonder why you need to spend the money on two books (so did I), but it is well worth it. When I started this study, I knew there were many areas of my life that needed to change, and as much as I wanted the change, I was afraid of the pain that would come with it. This book doesn't just expose lies we believe; it exposes sin. It doesn't beat around the bush. It looks at gritty issues for what they really are. There were many issues that came up in this study where God was already convicting me. There were things that He was repeatedly teaching me and were coming up in so many different places, that I just couldn't run from them. I had to face head-on lies I was believing about sin, purity, authority and media and deal with them. One of the blessings that came out of this study was simply spending more time in the Word aside from just my morning devotions. This study wasn't about the book, it was about the Book, and it sent you searching through the scriptures all the time. It also emphasized memorizing scripture, something I always want to do, but have a hard time sticking with. A verse came to me last week, that wasn't mentioned in the study, but I feel it kind of sums it up. I would definitely recommend this book to young women. If you're around the age of 20+, don't look at it and think you're too old for it, especially if you're still single. (I kind of did that.) The issues discussed in the book do still apply to you. If you're married, you can always look to Lies Women Believe by Nancy Leigh DeMoss. As young women, we are called to be examples to the world. If you want to grow in your relationship with God and be filled with His Truth, this study is a great place to start.